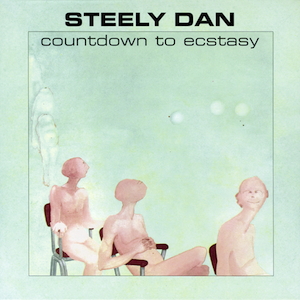 Steely Dan's sophomore effort, Countdown to Ecstasy, was released in 1973, back in the days when recording artists used to release one album per year. It was also released back in the days when lead vocalist Donald Fagen was taking his lead vocal responsibilities a little more seriously. Over the years, as the band's live presence diminished and their musical complexity increased, one attribute of their music slowly waned: Fagen simply seemed less interested in the lead singer's role. So, for me, when I listen to the older Steely Dan albums, Fagen's voice always stands out to me. He was never going to be Stevie Wonder, but as a 1970s singer-songwriter icon, Fagen was capable of tender vocals, at least as tender as vocals can be when they're singing lines like "Well I've been around the world / And I've been to Washington Zoo..."
Don't misunderstand me. I am aware of the depth of Fagen's lyrics, just as I am aware of the depth of Frank Zappa's lyrics. But Fagen, like Zappa, has always had a knack for using comical language to make serious points. That is, part of the charm, but it presents a challenge to the lead singer, who has to do both things, convey the whimsy and the grit. Well, on Countdown to Ecstasy, Fagen manages to do it. Another great element of this record is how great the arrangements are - certainly not surprising, coming from a Steely Dan album. Arrangements have always been their strong suit. One of the reasons they sound so good on this particular record, however, is because the production is so raw and dry. I recently made a similar point about a Richie Kotzen album. It's so important, because it's just so obvious on the great albums of the late 60s and early 70s. The magic has to do with two things: great performances, and great arrangements. The technology used to record these albums was primitive compared to what exists today, so they stuck to the basics: quality instruments played by quality players, with arrangements that left just enough room for each and every instrument to shine. On that level, it's the small subtleties that clinch it: the vibraphone on "Razor Boy," the sparse acoustic guitars on "Boston Rag," the oh-so-light phaser applied to the electric piano during the solo in "Your Gold Teeth." Hilariously, the high point of the album is one of Steely Dan's most commercial song of all time, "My Old School." The way it's written, it could almost be a Billy Joel song, or even - I admit with a shudder - an Elton John song. The syncopated piano chords, the cowbell, the female backup singers... this is how Steely Dan either seeks to participate in the singer-songwriter fad, or parodies it. Either way, I defy anyone not to bob along with its infectiousness. If you're listening to the full Steely Dan discography, enjoy it while it lasts. As the years unfolded, they took their music into ever-more experimental territory, demanding ever more from their session players, a who's-who of great 70s players. But on Countdown to Ecstasy, the band stayed centered neatly in the world of early 70s pop, merely alluding to the genius that lay in store with nice arrangements and a jazz chord here and there. The result is something special in its own right.